In this article we are going to focus on how to apply themes based on user choice. We will apply theme(style,skin) dynamically to a page at runtime in the Page_PreInit event of the Page using Theme property of the Page class. In this article we are going to focus on how to apply themes based on user choice. We will apply theme dynamically to a page at runtime in the Page_PreInit event of the Page. A Theme is a collection of styles,images,skins that define how the controls or your web page appear. Using a Theme we can easily change the overall appearance of a website. Open Microsoft Visual Studio ->File -> New Website -> Visual C# -> Name:ThemesDemo. select Add ASP.NET Folder -> click Theme. Create two theme folders namely: BlueTheme and PinkTheme. 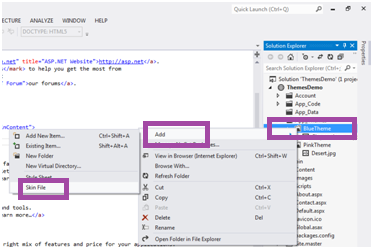 In order to add the second theme: right-click the App_Themes folder -> click Add ASP.NET Folder -> click Theme. Inside the BlueTheme theme folder, add the Chrysanthemum.jpg image from the attached source code. similarly Add the Desert.jpg image to the PinkTheme theme. <asp:Button ID="btnSubmit" runat="server" Text="Theme Demo"
Note that we are changing the Theme of the page using Theme property of the page in the Page_PreInit event of the page. You cannot change the theme in any other page event. An important point to note is that this setting will override the control properties in the webpage.